Holly Wells died after accidentally falling into Ian Huntley's bath, his lawyer told the Old Bailey Soham trial. Jessica Chapman also died after Mr Huntley covered her mouth with either one or both his hands to stop her screaming, Stephen Coward QC said. The girls had gone into Mr Huntley's bathroom so he could help Holly with a nosebleed, Mr Coward told the court. Mr Huntley denies murdering the 10-year-old girls, who disappeared on 4 August 2002. Holly's parents Kevin and Nicola, as well as Jessica's mother Sharon were in the court to hear the first airing of Mr Huntley's version of events. Mr Coward - who gave Mr Huntley's account as he cross-examined a forensic expert - said the girls sat on either side of the bath, which had 18 inches of water in it as Mr Huntley planned to bath his dog. Mr Coward said: "Mr Huntley was getting pieces of tissue or toilet paper, putting them under the cold tap to cool them and handing them to Holly. "On one of his turns from getting the wet tissue he slipped and it seems that he may well have banged into her as she was sitting on the edge of the bath, and she went backwards. "He has no recollection of a bang, but he does remember a splash." Mr Coward then told the court that Holly's fall into the bath had caused her friend to start screaming. "Jessica stood up and started screaming 'You pushed her, you pushed her'. "And he then turned towards Jessica and either with one hand or two, he's not sure, put his hands out towards Jessica, his memory is over her mouth, to stop her screaming. "For how long he was in that position he can't say. "But he was then conscious that Jessica was no longer supporting herself on her feet. "He let go and she went to the ground. He then turned round to the bath and Holly was lying in the bath, apparently dead. "He lifted Holly out of the bath, put her on the floor, looked for signs of breathing and found none. "He turned his attention to Jessica, he looked for signs of breathing and found none." The jury had previously heard only that Mr Huntley was "unlikely to deny" that the girls had died in his house while he was alone with them or that he had disposed of their bodies. Earlier the court heard from the Home Office pathologist who conducted the post-mortem examinations on Holly and Jessica gave evidence. Dr Nathaniel Carey said he had been unable, at Addenbrooke's hospital, in Cambridgeshire, to establish the cause of the girls' deaths because of the state their bodies were in when they were found. However, he was able to exclude the possibility that they had died from natural causes. "These were two fit, healthy young girls," he said. When asked his opinion of the defence account of the girls' deaths, he said he could not do so immediately as it had never been suggested to him before. He said: "I'm slightly concerned that this is the first I have heard of quite a detailed scenario. "I might consider such a scenario, had it been put earlier, with forensic scientists who had examined the scene, the bathroom, and the clothing. "I don't think I can give it fair credit otherwise." Trial judge Mr Justice Moses gave Dr Carey permission to discuss the scenario with other experts provided their names and details of the discussions were put before the court. He will continue his evidence on Wednesday. In other evidence, botany witness Patricia Wiltshire said that during her examination of the red Ford Fiesta, samples from underneath the car matched soil samples from the place where the bodies were found. Ms Wiltshire said she and colleague Peter Murphy had inspected a 100m area around the site near Lakenheath, and taken samples. One of the aims was to determine exactly whether or not the accused had been there, and if so, where he had stood. Also, when she studied the pedals of the car, there had been some transference of spores. 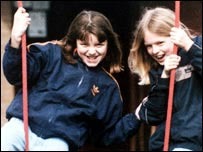 Mr Huntley denies murdering the girls, who disappeared in August 2002. But he admits conspiring to pervert the course of justice. Miss Carr denies helping an offender and conspiring to pervert the course of justice. "The girls' families have sat through four weeks of this trial waiting to hear an account of what happened"